One of the hottest bands in Jewish music, 8th Day hit the jackpot with their hit song Yaalili that saw hundreds of thousands of viewers on YouTube. The album that song was on, Chasing Prophecy, really started the 8th Day revolution. Their most recent album, Hooleh, had a bunch of hits and 8th Day started booking huge concerts. Now they’re everywhere and everyone has heard their wonderful songs. 8th Day consists of 2 brothers, Shmuli and Bentzi Marcus. Their brother Eli Marcus put out a debut album earlier this year to rave reviews. Their cousin, Benny Friedman, put out his third album this year as well. Their uncle, Avraham Fried, has been a legend in the Jewish music business for years. I’m sure you knew all this but it’s good to review some times. Now on to their brand new album. 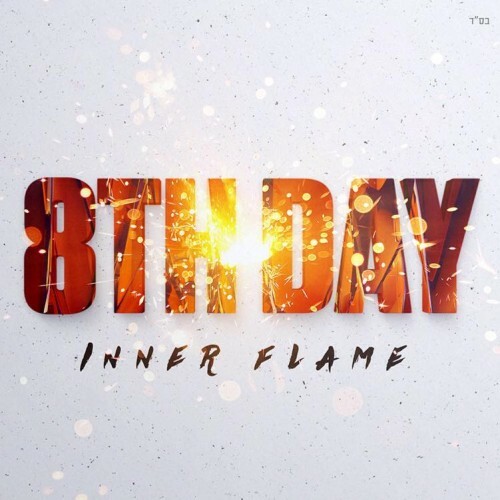 Inner Flame has 11 brand new songs, written by Shmuli and Bentzi themselves. Their sound is upbeat and rocky, and their lyrics are usually in English with the occasional passuk thrown in. Bentzi also plays guitar on the album while Shmuli is the lead vocalist with Bentzi helping out. On to the songs. CELEBRATE 2- Released as a music video about a month ago, this song translates the words of Tehillim that we say before benching. An upbeat and fun song with an equally awesome music video, this song is a great way to start off the new album. JUST LIKE YOU- One of the best songs on this album, it talks about how material things are not real and how we are all really just passing through, just like the tourists that asked a sage (I think it was the Chofetz Chaim) why he has no furniture. A really beautiful slowish song that really hits the heart. INNER FLAME- The title track, I love this song, it’s in my top 5 of this album. It has this really cool guitar sound in the background and I love the mid. It’s a new type of song that I’ve never heard from this band. TEARS- This song talks about the imahos, Sarah, Rivka, Leah and Rochel. They cried tears for us and saved us at many times. Towards the middle of the song, the music cuts out and just the brothers sing. I thought that was a very cool move. DAYS R COMIN- An interesting song with lots of trumpet. This song is about the end of days and mashiach. I love the low part with the choir in the back. The mid has a very cool sound and the high is nice as well. UTZU EITZAH- A sefardi sounding song that doesn’t really interest me much. R’ AKIVA- A slow song about the story of the great sage R’ Akiva. This song touches your heart, with just the piano in the background, it’s truly beautiful. Towards the end a violin comes in as well adding to the beauty of it. JERUSALEM STONE- A kumzitz type song with accordion in the background. The high part of this osng is very nice, it talks about how the stone “waited” for the rebuilding of the Beis Hamikdash all these years. CHAMPIONS- A song all about how great the Jewish people are, especially YOU! A funky song with beautiful lyrics, this song will pick up your mood, guaranteed. RAIN 2.,0- 10 years ago, on their first album, Jewish Music’s Hottest New Sound, 8th Day released the first version of Rain. Now they redid the song for this album. It’s a very nice, slow song with an upbeat and positive message. 8th Day also redid another one of their songs a couple of albums ago, redoing Manhattan on All You Got. WHISPER- This song is a very cool song with fast lyrics, followed by slower and then the high of Kol M’Vasser. It’s an awesome song with some sick electric guitar and a great solo in the middle. Its a great way to end off this album. In conclusion, though this wasn’t their best album in my opinion (that title goes to All You Got), its still a very good album from 8th Day and if you’re a fan you will enjoy it like I did. Get it on mostlymusic.com or wherever you get your jewish music from.